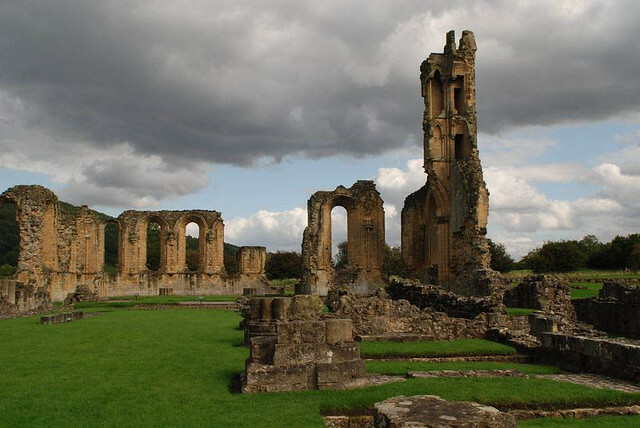 Byland Abbey was said to be among the finest 12th-century churches in Europe, housing over 200 monks. Impressive remains can still be seen, including the lower half of a huge rose window on which the famous window in York Minster was based. Still preserved at the site are coloured floor tiles depicting a variety of geometrical shapes and the only stone lectern base in England. 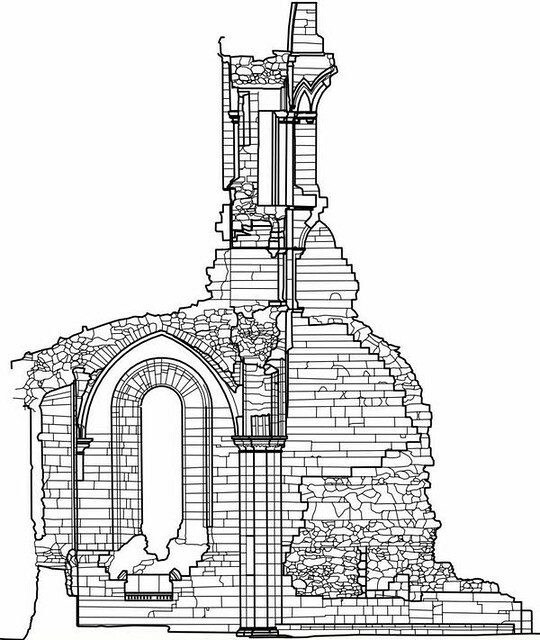 DJA/GSS were asked by English Heritage to provide detailed drawings of a part of Byland Abbey as par of an investigation in to the weathering of the structure. 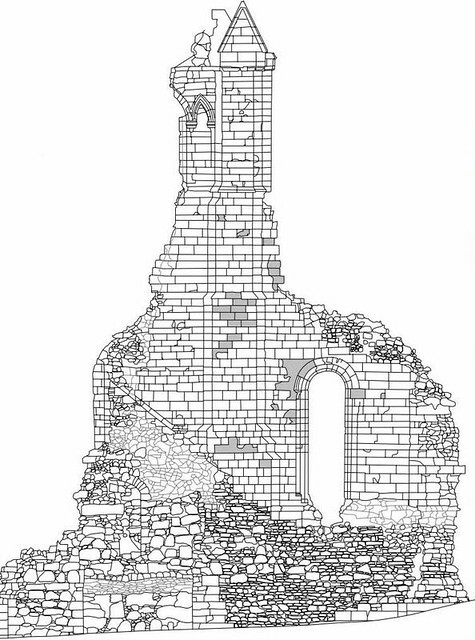 Due to the relatively exposed location, the softer stonework in the structure had become undercut and a key requirement was accurate provision of cross sections through the wall as well as an accurate elevation of both sides. The fact that laser scanning is a non-contact method of measurement was very important as this meant that we could gather the required information without disturbing the structure at all and there was no requirement for scaffolding. The survey took place at the far end of the abbey enclosure, with the survey team working from battery and a small generator. Scans were taken from four locations using the Mensi GS200, picking out the top of the 20m tall structure in great detail, with a series of 15 full colour scans from the Faro LS880 filling in the lower part of the structure and capturing a good deal of the other structure in the vicinity. All laser data was tied together using total station surveys back to existing survey points on the site, allowing the data to be compared with past surveys and be used for monitoring purposes. On return to our offices, the scan data was processed using FARO Scene, compiling both the long range and short range data with total station data to the correct reference origin. We then used Pointools and Rhino software to create a series of cross sectional drawings, and a set of orthographically rectified elevation drawings. The final deliverables package consisted of over 4Gb of data, including 2 orthographic rectified images and respective elevation drawings, along with a full set of cross sections. 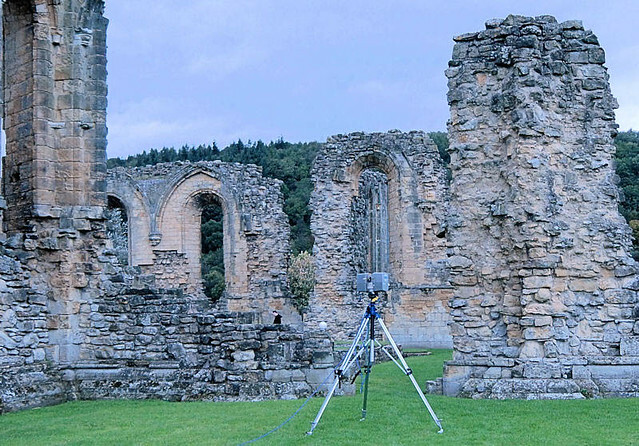 For further examples of the 3D laser scanning survey work, please visit our Flickr site.